There is nothing like sitting around log fire, especially on a chilly day, and with the weather getting colder you may feel like turning up the heat with an open fire or wood burning stove. You have probably had your chimney swept ready in the Autumn. But when was the last time you checked the 1st floor link? Did you know debris and dust can accumulate in the 1st floor fire place and cause a chimney fire? Check this space regularly to make sure it is clear. Do you stack your logs next to your wood burner? If may look nice but there is a risk of accidental ignition via radiated heat, particularly over a period of time. Store firewood outside, away from buildings. Get your chimney swept at least once a year. 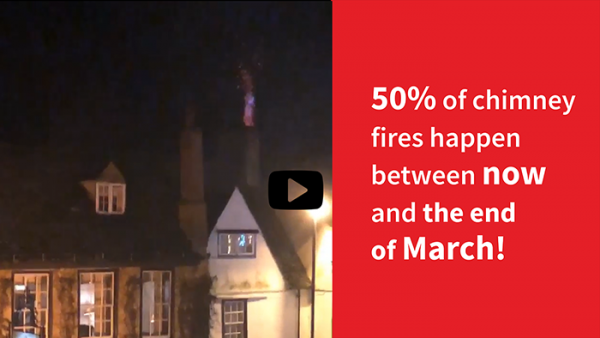 Check the 1st floor fire place link and make sure it is clear from dust and debris. Do not stack logs or place any other combustible materials immediately next to the stove. Never leave a lit stove unattended for any reason. The stove or boiler should be the correct size for the room. It should be installed by a competent person, following the maker's instructions and the building regulations and codes of practice. Make sure there is always enough air coming into the room and that the chimney is clean. Only use dry and well-seasoned wood (moisture content less than 17%). A well-seasoned log will have drying-out splits in the ends. Wet or newly-felled wood can cause tar or creosote to form in the wood burner and chimney. If the creosote is not removed through yearly cleaning, there is a significant danger of the creosote igniting and causing a chimney fire. The chimney should be cleaned at the end of each heating season and at least once during the heating season. Take extra care and wear the proper protection when opening the stove door, adding to the fire or touching any part of the wood burning stove. 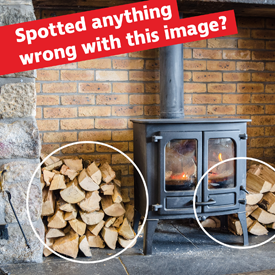 Store firewood away from fire places or stoves as there is a risk of accidental ignition via radiated heat, particularly over a period of time. Store firewood outside, away from buildings. Don’t overload your fire place or burn resinous woods. Let the fire burn out completely before you go bed. Always check round the fire place for hot embers or sparks. Use a British Standard fire guard to prevent sparks escaping. Fit a smoke alarm on each floor of the building, check the batteries regularly and change the batteries yearly (unless you have 10 year batteries). Improper ash removal from fireplaces and wood burning stoves cause many fires every year. Hot coals can stay hot for up to four days when they insulated by a pile of ash. Store ash and hot coals in a metal container that can be tightly closed with a metal lid. This helps keep air from blowing through and disturbing the ashes which can leave hot coals exposed for re-ignition. Wet ashes prior to closing the metal lid. Never place hot ashes in your wheelie bin. Wood ash, once completely cooled can safely be disposed of in your garden. Natural firewood ash makes a great additive that your plants will enjoy. Make sure you remove any mulching material such as dried leaves and other dried plants first, so there is nothing to catch fire in your garden. Make sure you have your appliances installed and regularly serviced by a qualified engineer. Ensure your home is properly ventilated. Never block vents. Make sure all chimneys are regularly swept and flues are kept clear. Only burn fuel the fire or stove is designed for and don’t overload the fire. Fit a carbon monoxide detector as an additional safeguard against the build-up of poisonous fumes.